A Navy petty officer testified Tuesday that he wasn’t drunk or speeding when he lost control of his pickup truck on a transition ramp to the San Diego-Coronado Bridge and crashed into Chicano Park below, killing four people. 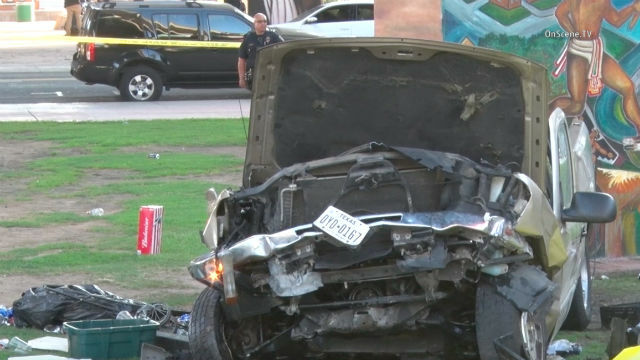 Richard Sepolio, 27, is charged with gross vehicular manslaughter while intoxicated, DUI and reckless driving in the Oct. 15, 2016, deaths of Annamarie Contreras, 50, and Cruz Contreras, 52, a married couple from Chandler, Arizona, and Hacienda Heights residents Andre Banks, 49, and Francine Jiminez, 46. Seven other people were seriously injured. Sepolio testified that he was driving on the transition ramp — a route back to Coronado that he had driven more than 90 times before — when he sped up to merge in front of another car and lost control. He said an officer had him blow into a breathalyzer three times and told him two of the readings were .05 and .06 percent. The officer said “You’re not drunk,” Sepolio told defense attorney Paul Pfingst. Sepolio testified that he had a glass of alcoholic cider and a glass of wine at lunch before heading back to Coronado. He told Deputy District Attorney Cally Bright that he didn’t remember a lot of what officers asked him at the hospital. In her opening statement, Bright told jurors that Sepolio was traveling more than 80 mph on the transition ramp from northbound Interstate 5 to the bridge about 3:30 p.m. when he lost control of his truck, which plummeted into the park where hundreds of people were enjoying a rally for motorcycle riders. One of the first responders smelled alcohol on the defendant’s breath, the prosecutor said. Based on a blood draw done at the hospital, an expert estimated Sepolio’s blood-alcohol level at between .08 and .09 percent at the time of the crash, Bright told the jury. Pfingst told the jury that Sepolio, an aviation electrician who works on helicopters at North Island Naval Air Station, passed two blood tests and two breathalyzer tests administered to him by law enforcement. Pfingst said Sepolio lost consciousness and suffered bruised lungs in the crash but refused pain medication so he could tell officers what happened. Closing arguments are scheduled Wednesday.